SOUL FOOD for Young Adult Communities: Sunday Sept.1st 2013: 22nd Sunday in Ordinary Time. SOUL FOOD for Young Adult Communities: Sunday Sept.1st 2013: Twenty Second Sunday in Ordinary Time. Gospel: Luke 14:1 and 7-14. Click here for Mass Readings for today. Two young people decided that they wanted to meet God. So they started to climb this great mountain. Half way up, they passed a stranger heading down to the valley below. When they got to the top, the asked where they could find God. The answer they got was: did you not meet God going down the mountain to the valley below? Thumbs up! Francis, in Rio. an interview to the media. He told them about the moments leading up to his election, when the votes were adding up and it looked like he would be chosen. A great friend of his, sitting next to him, a Brazilian Cardinal, leaned over to him and said ‘Don’t forget the poor!’ And then, tapping his head, Francis told the journalists that those words hit him there in his head. 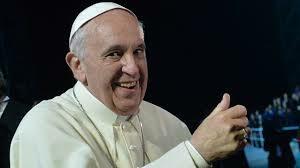 But then again, Francis, or George Bergoglio as he was called, had never forgotten the poor. He took public transport to work from his little apartment where he lived as Archbishop in Buenos Aires. He lived in the heart of communities, and of the poor. 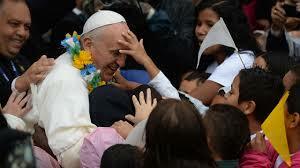 Francis at home with young people! In our communities, in our gatherings for the breaking of bread, we are meant to break bread (be com-panions) with everyone in our community where we live, especially with those who need our presence and love. Have we invited ‘the poor, the crippled, the lame and the blind’ into the party of our young hearts? God is where they are. Are we?